CA or ICWA after MBA in Finance and Marketing and application procedure for the same? Details about ICWA after MBA in Finance? Benefits of distance ICWA after MBA? Is this a wise decision to do ICWA after MBA for a bank professional and having 3 years work experience? Admission procedure for the same? Is it good to do ICWA after competing MBA in Finance & Marketing? Is it beneficial to do ICWA or CA after MBA in Finance or Marketing? Details like admission procedure & course duration for ICWA course after MBA? Re: CA or ICWA after MBA in Finance and Marketing and application procedure for the same? ICWA Executive can be done even if you have score less than 55% marks in your graduation but CA Executive Course expect at least 55% marks in Graduation from students . CA is tough than ICWA. CWA institute provides expertise in Cost & Management Accountancy , Enterprise Resourse Planning & Business Valuation, Auditing ( Both Cost & Financial Audit - But Cost Audit is specialised ),Tax Management ( Both Direct & Indirect - But Indirect Tax is of superiest quality ),Financial Accountancy. These courses have centers all over India . 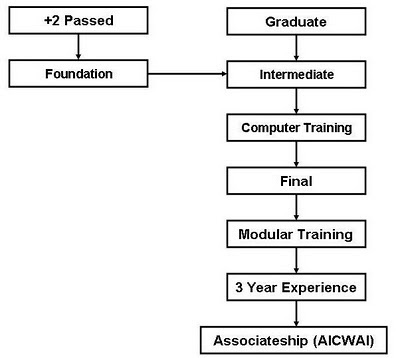 Procedure to apply ICWA course being a candidate having completed MBA and working in IT Company? How many hours I have to study to complete this course? What are the procedures and rules and which type of documents to be submitted far CA? How much one has to study for clearing CA? What should i do after CFA from ICFAI between ICWA and MBA? Question paper pattern of ICWA? Eligibility criteria to do ICWA? Am i eligible for it as pursing MBA from PTU? Fee structure and place of study? Details about good colleges for ICWA?